I remember when I read Firestarter for the first time. I was in high school, in the early ‘90s, and had started thinking that I’d maybe like to be a writer myself one day. 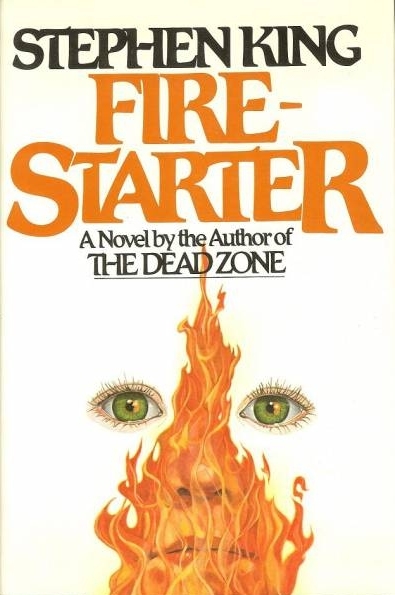 There are two reasons why Firestarter stuck in my head long after I finished reading it. For one, it’s an excellent story about the burden of psychic powers on ordinary people and the government machine that wants to use them for their own nefarious purposes. The other reason it stuck with me is because it was my first real lesson in the marketing side of the publishing business. By the time Firestarter was published in 1980, Stephen King was already well on his way to becoming established as the King of Horror. Part of this was because he was indeed a powerhouse of a writer, but part of it was also due to the fact he was becoming a brand. My understanding of this came quite naturally, mainly by the simple fact that several of his books, published up to that time, didn’t really strike me as horror novels. Of course it could be said that horror, like any other genre label, is in the eye of the beholder, but I think it’s fair to say it would take more than a bit of a stretch to describe books like The Dead Zone and Carrie as horror novels. Scary things happen, sure, but I feel, at least in those two cases, that the books belong more in the thriller genre, or even science fiction. Same goes for Firestarter. I remember thinking that at the time I first read the book and then immediately dismissing the thought, probably because I didn’t really care what genre it fell under. It didn’t change the fact that it was a damn good read. Firestarter tells the story of Andy McGee and his ten-year-old daughter Charlene “Charlie” McGee. They’re on the run from a government agency called The Shop because when Andy was in college he participated in an experimental drug trial. One of the other participants was Vicky Tomlinson, who would become Andy’s wife and mother to Charlie. Andy and Vicky developed psychic abilities from the experiment, and passed those powers on to their daughter in the form of pyrokinesis, the ability to create and control fire with her mind. I was a big fan of The Uncanny X-Men in my teens, and this might have gone some way toward explaining why I enjoyed Firestarter so much. It was as if King was writing his own X-Men story, one that describes what life would really be like for people who possessed superhuman powers. Except instead of fighting crime and living in a mansion with a high-tech training facility in the basement, Andy and Charlie spend their lives on the run from government agents. They can’t even use their powers without hurting themselves. For Andy, a mental dominant, using his power causes pinprick brain hemorrhages that will kill him if he uses it too much. While Charlie doesn’t suffer as much physiologically, she harbors a deep guilt about using her pyrokinesis, constantly worried that the “Bad Thing” will get loose and kill everyone. With the publication of books like Doctor Sleep, in which King revisits the Danny Torrance character from The Shining, I have to wonder what ever happened to Charlie McGee after she walked into the office of Rolling Stone to tell her story. King initially wrote Firestarter after he became interested in the idea of what would happen if the titular character from Carrie passed on her powers to her daughter. In later interviews, King would joke about what would happen if Danny from The Shining married Charlie from Firestarter and they ended up moving to ‘Salem’s Lot. We’ve found out what happened to Danny. Maybe it’s time King turned his attention next to everyone’s favourite firestarter. Ian Rogers is the award-winning author of the dark fiction collection Every House Is Haunted. His novelette, “The House on Ashley Avenue,” was a finalist for the Shirley Jackson Award and has been optioned for television by Universal Cable Productions. For more information, visit ianrogers.ca. Yes! A Charlie sequel would be excellent. A pairing with Danny is still doable! Excellent write up Ian! Thanks for sharing your thoughts. I agree. It sounds doable! Wonderful thoughts on the subject. I would love to see the movie, if there is one. I too would like to see what happen to Charlie as well. By the way, you put a u in color. Are you English or Canadian…? Just wondering.